If you have elementary aged kids... and you're going to be staying local for the Winter Break, think about fitting in a little pirate fun! After receiving an email from Christopher Leidenfrost (who is one of the shows co-creators and plays pirate Captain Henry Martin) I was really disappointed that we won't be around the Pirates' entire showing. Their previous show (The Greatest Pirate Story Never Told) had some amazing reviews... and the videos show a really fun show. We were offered some show tickets... and I'm really happy my friend Cecilia is able to go with her family. I'm excited to hear what she, and her kids, think! When a crew of misfit pirates sets out to break a curse by putting on a musical, holiday spectacular(rrr...), they find themselves in need of some help when several important bits of their plot go missing! 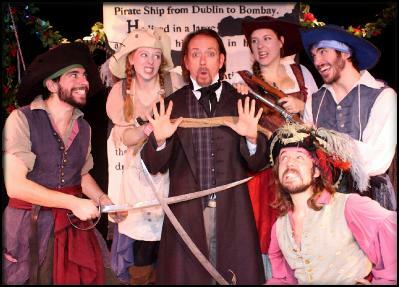 Now, it’s up to YOU to fill in the blanks as they improvise a brand new, holiday adventure full of swashbuckling song, dance, sword fights, and boatloads of laughs for all ages! Can five pirates, three ghosts, a bumbling Sea Witch, and Charles Dickens himself rewrite the classic tale... before it’s too late? Theatre 54 is part of the Shetler Studios complex located at 244 W. 54th Street, on the 12th Floor (elevators available), between Broadway and 8th Avenue. 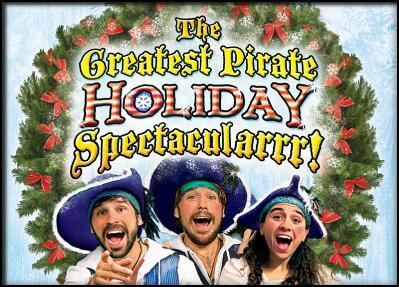 Performances of THE GREATEST PIRATE HOLIDAY SPECTACULARRR! begin Christmas Eve at 11 a.m., along with 11 a.m. performances on December 27, 28, 29, 30, 31, and January 2 and 3. All photos courtesy of www.greatestpiratestory.com.